When I was bleeding to death in my Black Hawk helicopter after I was shot down, I didn’t care if the American troops risking their lives to help save me were gay, straight, transgender, black, white or brown. All that mattered was they didn’t leave me behind. Aside from all the the misery this will inflict, from a purely practical standpoint, here’s another time-wasting political battle of spite and bile that pisses away resources and the efforts of lawmakers and military personnel and puts people out of work over an issue that’s ostensibly about money. “The ban on transgender service members isn’t just discriminatory, it’s disruptive to our military and counterproductive to our national security,” Duckworth added. 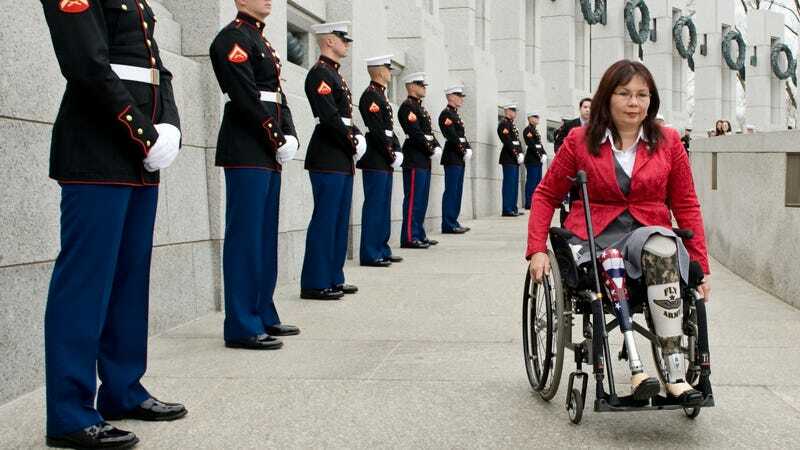 Duckworth says that Congress must pass legislation against the ban if it does take effect. Legislate. Meanwhile, he’s going to keep doing this.